WASHINGTON — Raytheon and Kongsberg are teaming to produce a fifth-generation naval strike missile (NSM), the two companies announced Thursday. 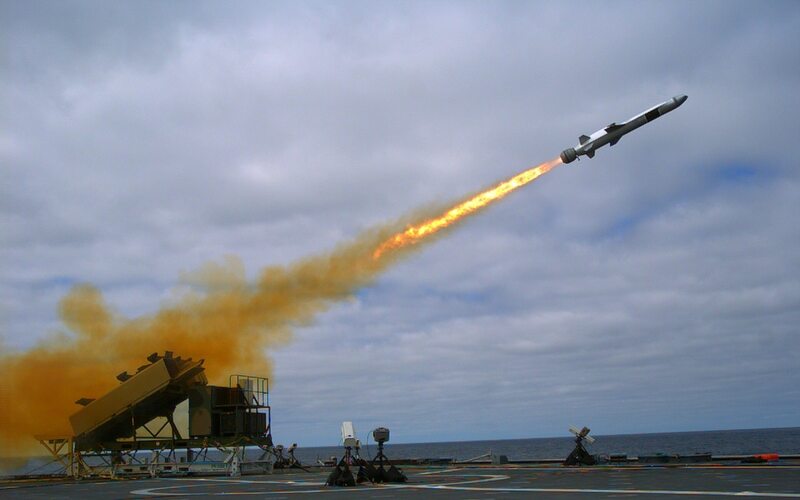 The American and Norwegian firms unveiled a similar partnership last year with the Joint Strike Missile (JSM), an anti-ship weapon launched from the air. The companies are hoping to integrate the JSM into F-35 joint strike fighters. Raytheon and Kongsberg will collaborate on the NSM, with an eye toward marketing it to the US Navy's next generation of littoral combat ships (LCS). Because the Norwegian government has already borne the costs for developing the NSM — the missile is already in use on Norwegian frigates and corvettes, as well as Polish land defense systems — the companies hope it will present an affordable option in today's cost-conscious budget environment. "It's a very good fit, and a very affordable weapon for the US Navy," said Thomas Bussing, Raytheon's vice president of advanced missile systems. The midrange missile can strike targets on land and sea more than 200 kilometers away, said Harald Ånnestad, president of Kongsberg Defence Systems. Because the NSM uses an engine normally installed in missiles that weigh twice as much, it has enough maneuverability to avoid defensive measures, he said. "We can constantly change acceleration and do maneuvers without losing speed," he said. While the NSM is already in production in Norway, the missile could be built and assembled in America if the US buys the weapon for the LCS, said Bussing. "There are several international opportunities that are being pursued in parallel," he said. While Kongsberg was rolling out details of its tie-up with Raytheon to push NSM for the US Navy requirement, the Norwegian company was also announcing a sales success for the missile in Asia. The company has secured what it called a "letter of award" from the Boustead Naval Shipyard in Malaysia to prepare for the installation of the NSM onboard six littoral combat ships scheduled to be built at the yard using the Gowind design of French shipbuilder DCNS. The Kongsberg work involves preparation of fixed items like the launcher, cables, electronics and integration with the combat management system ahead of a production contract for the NSM. The first ship is scheduled for delivery in 2020. Malaysia is set to become the third operator of the missile following orders from Norway and Poland. The latter uses the weapon in a land-based coastal defense role. "This agreement with Boustead Naval Shipyard is to prepare the future Royal Malaysian littoral combat ships for NSM and confirms NSM's very strong competitiveness in the international market. Malaysia is the third user of this modern fifth-generation anti-surface weapon," said Kongsberg's Ånnestad.